Meet the beers we craft. Koi Pond Brewing Company was founded to provide high quality, interesting and delicious craft beer. These are descriptions of some of our beers. We also offer an ever-changing lineup of seasonal and specialty beers featuring the finest in local produce and using unique ingredients in creative ways. We have 8 taps at The Pond so not all these beers are available all the time, and many are seasonal. We encourage you to stop by and try out a few and keep an eye out for seasonal offerings. Longstreet American Pale Ale – This golden-amber, refreshing and lightly hopped ale is a popular brew among today’s craft brew audience. The maltiness of an amber and the citrus hops notes of an ale makes this a great fit in the broad field of craft-brewed ales. Pairs well with everything! Angry Squirrel American Amber Ale – Malty and balanced. These are the 2 words that best describe this favorite of our regulars. It is substantial and crisp with caramel and butterscotch notes that compliment a light, bright hop finish. Pairs well with puppies and new friends. Bozo Brown American Ale – This brown ale is balanced with caramel grains and just a kiss of traditional English hops. Bozo finishes clean with just a hint of chocolate rye. Bobo Brown Ale fills the space between Angry Squirrel and our line of stouts. Pairs well with horseback rides and college football. Greenwood Ave. IPA – As a dedication to the old neighborhood, this beer was brewed to be enjoyed when only a light, flavorful, bright, and interesting IPA will do. Citrusy and piney and easy-drinking, this beer is an homage to those to the good ole days. This is Jared’s second contribution to our lineup. Pairs well with Mario Cart and Unemployment. Accidental IPA – This west coast style IPA balances the floral and piney notes of 4 different hops to bring an even-handed and bright India Pale Ale to the table. 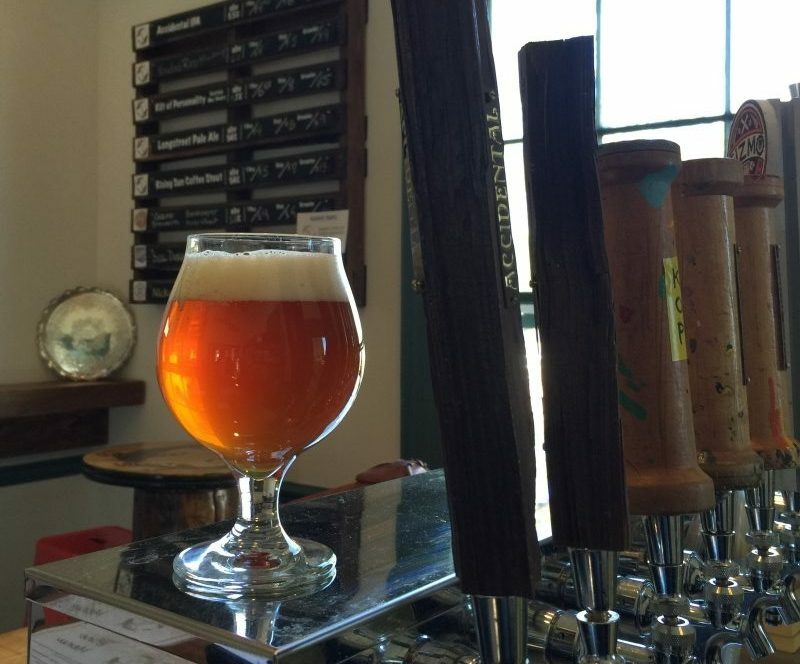 Accidental is a solid example of what made IPA’s so popular with so many craft beer fans. Pairs well with cookouts and bocci ball. Happiness Rye IPA – A certain brewer and his bride had a rye IPA at their nuptials and it has remained a favorite style that reminds them of their special day. Rye in the grain bill gives Happiness a peppery pop that works well with the sizeable hop additions to this IPA. Pairs well with wedding dressed and blushing brides. Double Dragon Imperial IPA – The next evolution in hoppyness…A lot of IIPA’s out there will kick you in the face with hops…ours certainly does that…but…afterward it cuddles you and tells you everything will be OK with a rich malty backbone sturdy enough to deliver the bright floral, citrus, and piney notes. Just north of 8% ABV this warms the soul and cools the savage beast! Pairs well with spicy foods and smoked meats and cheeses. Gateway Dubbel – Brewed as an homage the Trappist tradition, our Dubbel is a rich, malty beer with mild hoppyness and fruity yeast aromas. It has a caramel finish and comfortable sweetness from the dark candy sugars in the brew. It’s no surprise that a lot of people discover craft beers through Belgian dubbel ales. The gate is open, come on in. Pairs well with cheeses and chocolate desserts. 3 Monks Tripel – The monks would be proud of this traditional trappist-style tripel. Bright yellow-gold in color and a little boozey makes this beer a the perfect platform for a wide array of fruity flavors from the belgian yeast. 3 Monks gets its light body from the addition of belgian candi sugar to make it interesting and accessible at the same time, Pairs well with witty conversation and inside jokes. 10-Coin Day Golden Belgian Strong – This Belgian Golden Strong Ale is one of our more traditional styles. it’s fruity esters mimic apples, pears, and oranges. Spicy and sweet notes make this beer pair well with sweet and savory dishes. The alcohol content warms you while you enjoy this traditional Trappist Ale. ALSO occasionally brewed with cherries . VooDoo Wit – This refreshing witbier is brewed with wheat and oats in the mash resulting in a crisp and refreshing backdrop for the blood orange and grains of paradise coloring on top. Other flavors and spices give this beer a deep and interesting finish with a nod to tradition while updating the wit with new colors and flavors. Pairs well with seafood and chicken as well as salads. VooDoo Red – A raspberry twist on a Koi Pond flagship, VooDoo Red adds another color to our pallet of beers brewed with fruit. This beer adds a bright note of red raspberries to our traditional Belgian Witbier recipe. Tart and a touch sweet, this beer pairs well with a number of dishes and is refreshing in the summer heat. This beer shines with evening walks, new love and Southern California soft rock. VooDoo Haze – A seasonal watermelon twist on a Koi Pond flagship, VooDoo Haze combines two summer favorites, beer and melons. Haze brings a mellow coolness to our Witbier lineup and is a great way to beat the summer heat. Salads and seafood have never tasted so good as when paired with VooDoo Haze. Crazy Mary – Bananas in the mash! Crazy, indeed! A pound of ripe bananas for every gallon of this wonderful elixir lets Crazy Mary uphold the VooDoo tradition with a solid mash-up of fruit and beer. Pairs well with everything from dinner to dessert. Sunset Ave. – Session-able and light. We brought the alcohol down and kept the complex yeast profile of our saisons in Sunset Avenue. We love the farmhouse tradition of Belgian Saisons and it shows in this beer. Pairs well with gardening and open-toed shoes. Cheers! Naked Lotus – Naked Lotus is the base beer of our Lotus-series fruit saisons. Belgian grains and local honey are the stars of the show. Peach Lotus-In the farmhouse tradition of brewing with “what you got”, we brew and ferment with a generous portion of Halifax County peaches and Conetoe Family Life Center honey. Light and tart, this beer borrows a hint of dry white wine and a light and crisp head. Pairs well with love and puppies and long walks on the beach. Strawberry Lotus – 2016 NC Brewer’s Cup Gold Medal Winner in the fruit beer category. Local strawberries and local honey give this beer a real connection to our community. We are proud to share this saison with our customers when the strawberries are in season. Pairs well with good friends and winning! Pomplamoose – Refreshing anyone? Brewed with juice and rinds from fresh-squeezed red grapefruit this saison is light, refreshing and slightly bitter. We use Conetoe Family Life Center honey in this farmhouse-style ale. Pairs well with a wide variety of dishes and the heat of a summer day. White Elephant – Farmhouse Saison meets thai basil in bright and floral pairing. This ale bridges the gap between Belgian ale and IPA with an herbal twist. All of our saisons get a dose of honey sourced from the Conetoe Family Life Center (if you don’t know about them, look them up…it’s good stuff). Pairs well with everything from spicy food to BBQ. This is a foodie’s beer. Bon Appetite. Old Blue – Purple in hue with a subtle hint of blueberry, Old Blue is another in our line of summer-seasonal offerings. There is a rich tradition of brewing “with what you got” and summertime in NC means we got blueberries. This beer has a light citrus hop profile and is refreshing. This beer pairs well with live music on the patio and butterflies kisses. These beers are a blend of Falls Road Golden Kolsch-Style Ale and fruit juice in the German tradition. They are light and juicy and refreshing and just perfect for a hot day at The Pond! Rising Moon Traditional Irish Stout – We have a mocha java stout, rich with locally roasted coffee and cocoa nibs. We have a coconut, chocolate-almond stout with the same cocoa and locally-sourced coconut. Now, we will offer the beer-behind-the beers. Rising Moon is a traditional Irish Stout that is the base beer for our flavored stouts. It is elegant and rich and made with roasted barley and chocolate rye. It is has a deep black color and is the perfect beer with which to wind down after a long day. Pairs well with comfy slippers, solitude and a good book. Rising Sun Mocha Java Stout – packed with locally roasted Peruvian cocoa nibs and kissed with real vanilla, it shows incredible balance and chocolateyness. The locally-roasted Cackalacky Nicaraguan Dark Roast Coffee makes this stout a perfect option at any time of day.! Good Morning World! POW! Pairs well with desserts and grilled meats. Destination Coconut Almond Chocolate Stout – Dessert in a glass. Coconut, almond and dark chocolate, sound familiar? This beer is a joy, for sure. Dark and sweet, this stout shines with notes of roasted malt and bitter Peruvian cocoa. Toasted coconut in the mash smoothes things out and adds a bit of elegance to the party. Pair with sweet desserts, soft cheeses, or maybe a candy bar. Phatt Matt Chocolate Peanut Butter Porter – This 5.9% abv. porter has a great aroma and the peanut and chocolate flavors are balanced to give an excellent porter experience. It pairs well with a wide variety of desserts and makes Matt’s hair stand at attention. Wicked Elf Imperial Gingerbread Porter – Nothing says holiday festivities like a dark, boozy porter kicked with fresh muddled ginger. Warming you with dark roasted malts and 8+% ABV, this beer will keep you coming back from Turkey Day until the groundhog makes his seasonal debut! Pairs well with Charles Dickens, Santa Claus, and short days and long nights. These IPA’s are brewed in the New England style with oats, wheat, and lactose to give them a full body and substantial mouth-feel, hence the term “milkshake”. We pair this base beer with a revolving cast of fruit and hops to compliment one another for an explosion of beer-fruitatiousness! There will be…. Kilt of Personality – A deep copper color, sweet and full-bodied, our traditional Scotch strong ale is full of roasted malt and caramel flavors and has some sweet tea-like aromas. Pairs well with smoked meat and artisanal cheeses. Opening Day – This is a classic early-American style that has stood the test of time. Cream ales have corn and just a touch of hops to create a light and drinkable beer that is a great offering for the new craft-beer drinker. Falls Road Golden Kolsch-Style Ale – Light and crisp. Light and crisp. Light and crisp. When simplicity and elegance meet in a brewhouse, you get this traditional style made famous in Cologne Germany. Pairs well with everything, ever and always. Cucumber Basil Summer Ale – Opening Day (see above) + local cucumbers and local basil = a surprising mix of flavors that make this beer a surprise favorite, even for those who do not like cucumbers. This is a beer that begs to be paired with a meal. Down East Harvest Ale – Shine on Harvest Moon! We combined Nash County sweet potatoes with traditional fall spices to bring the warmth and comfort of Grandma’s sweet potato pie to a pint glass. Coppery and clean, this amber ale is a nice contrast to traditional pumpkin beers. Give thanks to your local hardworking farmer while tipping a glass of this truly southern ale.